To commemorate HCI's 40th anniversary, many of its most loved and revered authors have contributed personal stories of lifechanging events in Success Stories from the Heart. Poignant and inspiring from cover to cover, these authors generously share their personal journeys to find truth, the unexpected discoveries they made along the way, and the spiritual renewals they experienced as a result. A brave and mighty volume, Success Stories from the Heart bares their souls and tells the stories of not only their own lives, but of the many lives they've touched. Each contributing author in this extraordinary book has played a pivotal role in the advancement of mental health services and personal transformation. They coined the phrases, they made the discoveries, they are the vanguards who brought us a deeper understanding of the issues that affect us, our families, our communities, and every one of our relationships. They are the true, indispensable guides and mentors who rescue us from ourselves and each other, that teach us better, more fulfilling ways to live. These stories chronicle experiences that go beyond the educational realm, past office visits and therapy sessions, and brought them deep into the tender realm of the heart. They are the encounters that blurred the lines and made their work personal, the hopes and tears of their careers, the indelible scars that belie their commitment to do whatever it takes to make a difference. It is this blending of personal and professional life that births wisdom, that connects people, and heals a hurting world. 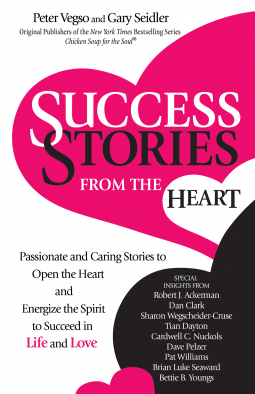 Let Success Stories from the Heart inspire you—it's a celebration of 40 momentous years and a thrilling celebration of life! Peter Vegso, is an entrepreneur and pioneer of self-help publishing, best known for being the original publisher of the Chicken Soup for the Soul series. Many years ago, Vegso made a commitment to be a conduit for good—for improving the lives of others in every venture he would undertake. Health Communications, Inc., the company he co-founded, is a leader in the field of mental health information. In addition to publishing books at HCI, his dedication to advancements in mental health care encompasses the experts who provide invaluable services to those in need and can be witnessed throughout the pages of the indispensable Counselor—the premier magazine for addiction and behavioral health professionals. U.S. Journal Training's conferences provide top-notch speakers, workshops, educational opportunities, and more to professionals in the mental health field who share his heart for humanity. Originally from Canada, he now lives in Boca Raton and Ocala, Florida, where he enjoys life with his wife of 47 years, Anne, their children, and five very active grandsons. Gary Seidler has been one of the foremost supporters of the addictions and mental heath field for the past 40-plus years as a publisher and professional conference organizer. A newspaper reporter and editor in Canada, he joined the Alcoholism and Drug Addiction Research Foundation of Ontario as Press Officer in 1970. In 1976, Gary and Peter Vegso, both in their early thirties, moved to Florida where they co-founded Health Communications, Inc., and the US Journal of Drug and Alcohol Dependence (later US Journal Training, Inc). Gary was closely associated with several bestsellers, including Adult Children of Alcoholics by Janet Woititz, Healing the Shame That Binds You by John Bradshaw, and the worldwide bestselling series, Chicken Soup for the Soul. He produced The Process, an award-winning docudrama which demonstrates the value of experiential therapy. His most recent project has resulted in The Heart Reconnection Guidebook. Gary continues to work closely with USJT in developing training conferences for professionals in the addictions/behavioral health field, and is executive consulting editor of COUNSELOR, The Magazine for Addiction and Mental Health Counselors.